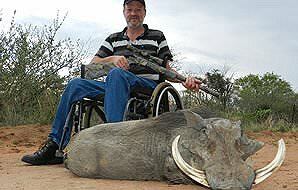 Trophy animals that can be hunted in South Africa as well as in the countries of Zimbabwe and Namibia. The formidable Cape (or African) buffalo is the most sought-after member of Africa's infamous Big Five. Imposing and unpredictable, hunting one of these behemoths is sure to be an exhilarating experience. 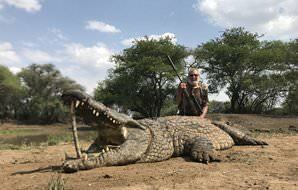 A truly unique trophy to add to your collection, the prehistoric-looking Nile crocodile is best hunted from a blind while he's out on a riverbank. Prices vary greatly according to size. A trophy croc can reach around 15 feet. 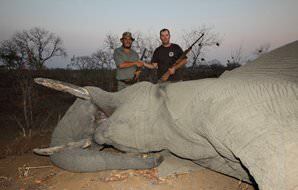 Hunting the world's largest land mammal is sure to get the adrenalin pumping. 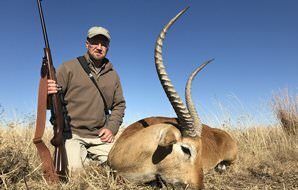 The largest rifle that you feel comfortable shooting is essential here, as a misplaced shot on this grey giant could spell serious trouble. Responsible for an extraordinary number of human fatalities on the continent, tread lightly when hunting the imposing hippopotamus. 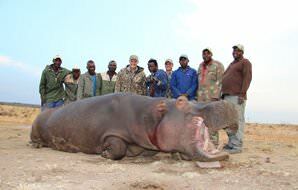 Hippo hunts are typically conducted at night, when they leave the water to feed. 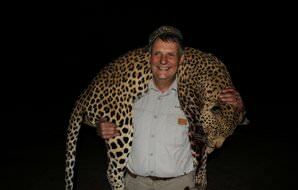 The leopard is the most elusive dangerous game species to hunt and requires serious patience. Expect a lot of time spent in the blind - likely in the dead of night - but this is an incomparably rewarding hunting experience if successful. 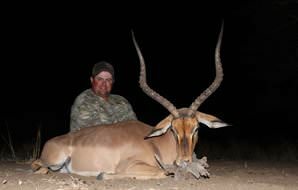 Pursuing the legendary king of the bushveld makes for an exceedingly electrifying hunt. 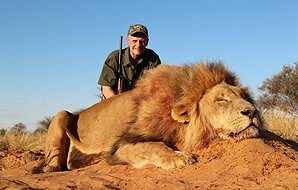 Our lion hunts are generally conducted in the primordial wilderness of the Kalahari in South Africa, with a significant of walking required. The black wildebeest (or white-tailed gnu) is considerably rarer than his blue cousin and occurs naturally only in South Africa. 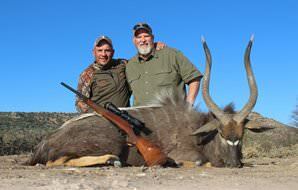 He is usually hunted on the rolling open plains of the Free State or Eastern Cape province. 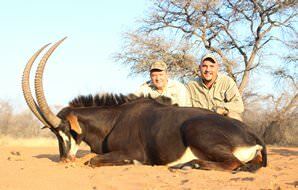 The common blesbok is endemic to South Africa and is one of the country's most popular plains game species to pursue. 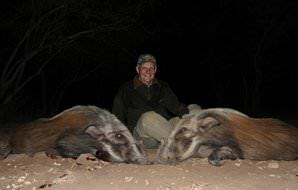 While they can be hunted in most areas, they're plentiful on the plains of the Free State. The white blesbok is starkly pale in color as a result of a gene mutation, which makes it a 'morph' species rather than a subspecies. 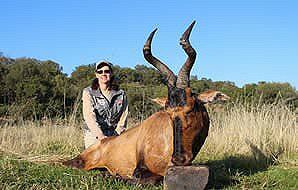 You'll find it in the same areas as the common blesbok, and the same rules apply. 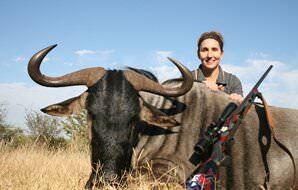 The bizarre-looking blue wildebeest makes for a fantastic addition to any trophy collection. 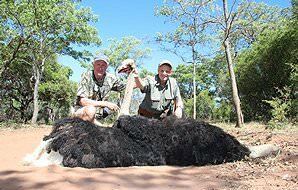 The 'poor man's buffalo' is also inherently associated with the African continent and offers a rewarding hunting experience. The uniquely colorful bontebok was once nearly wiped out in South Africa. With substantial numbers now thriving on game farms and in national parks, this handsome plains game animal makes for a striking trophy. 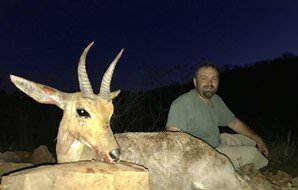 The handsome bushbuck can make for a surprisingly aggressive and elusive quarry. You'll usually pursue the smallest member of the spiral-horned antelope family in dense riverine forest or where he hides in thickets. 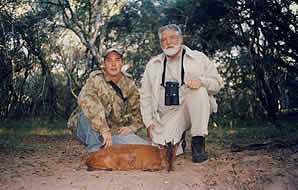 Hunting the bush pig is akin to pursuing the European wild boar. Bad-tempered and hostile, the bush pig is typically hunted after dark when he is most active. Be wary of his short (but razor sharp) tusks. Caracals are often hunted with dogs in the Eastern Cape or from a blind, making for a unique and exciting nocturnal pursuit. This shy, lynx-like cat has a beautiful pelt and makes for a handsome full mount trophy or skin. 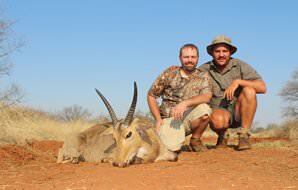 The common reedbuck is usually hunted in areas with floodplains, like the Eastern Cape and the eastern Free State. This stately plains game species is very fond of water and often encountered near waterholes. 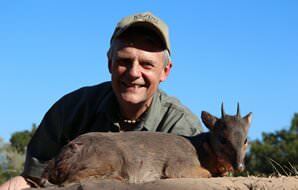 The tiny blue duiker makes for a very unusual trophy. He is the smallest member of the duiker family and one of Africa's tiniest antelope species. The hunt can be quite challenging, as they often hide in dense undergrowth. The grey or common duiker is a shy, small species of antelope that is usually encountered on his own. The rather solitary antelope is mostly active in the late afternoon and early evening, when he ventures out to browse. This attractive mini-antelope species clocks somewhere in size between its blue and grey cousins. You'll pursue the secretive red duiker in dense forest, coastal bush or mountain slopes with thick brush. 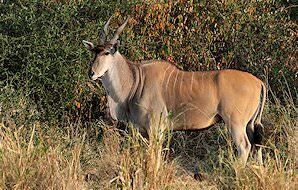 The Cape eland is the largest of Southern Africa's antelope species. 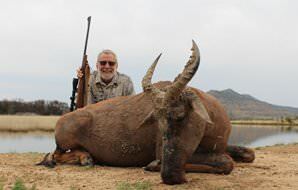 This ox-like animal makes for a very impressive addition to any trophy collection, occasionally weighing in at over 200 pounds. The Livingstone eland is similarly impressive to his Cape cousin, with white stripes across his back and impressive horns. 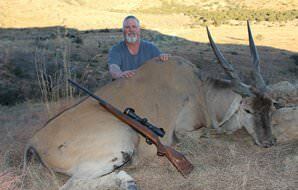 The Livingstone eland is usually hunted in Zimbabwe or the Caprivi in Namibia. 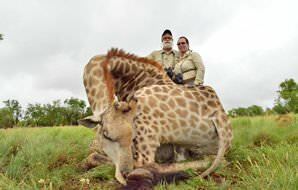 The world's tallest land mammal makes for a very unique hunting experience, and an awe-inspiring trophy you'll be indelibly proud of. The giraffe's keen senses and formidable legs augment an already-challenging hunt. 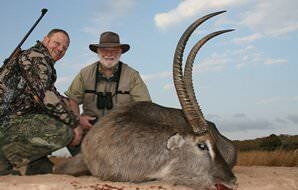 The grey rhebuck is usually pursued by serious hunters looking for something unique to add to their collection. 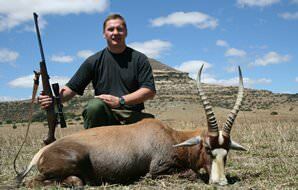 He prefers mountainous areas, and his straight, upright horns distinguish him from the similar-looking reedbuck. This European import can also be hunted in South Africa. Exclusively a grazer, the fallow deer adapts easily to most habitats and can therefore be hunted in various hunting areas, from the mountainous to open plains. 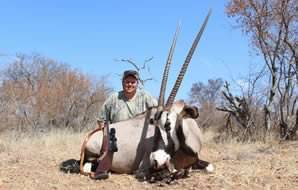 The stately gemsbok is synonymous with the Kalahari Desert and known for its remarkable ability to adapt to harsh, arid environments. Its masked face and striking spear-like horns make it a spectacular trophy animal. 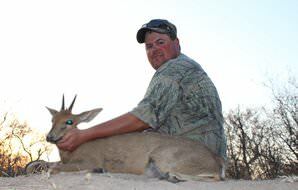 The impala is the South African hunter's bread-and-butter, and a great introduction to hunting in the African bushveld. They occur in abundance across the country and make for great game meat as well. The black-backed jackal is a coyote-like animal that is both an accomplished predator and a prolific scavenger. 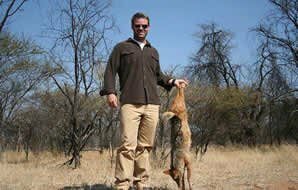 Jackals are usually hunted opportunistically while tracking or pursuing other game. The klipspringer is an attractive little antelope aptly named for its rather riveting ability to 'spring' from rock to rock. You'll typically pursue the klipspringer in areas with rocky or mountainous terrain. 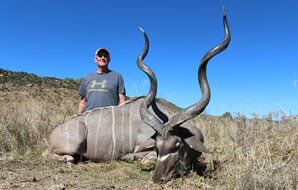 The greater kudu is a large species of antelope that is sought-after by local and international hunters alike. Its spectacular spiral horns and handsome 'body paint' make it an incomparably striking trophy. The red lechwe is one of the more unique antelope species available for hunting. Though usually found on the floodplains of Botswana and northern Namibia, ranching has made it available for pursuit in South Africa. 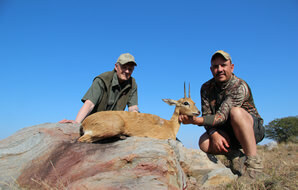 The mountain reedbuck offers a very challenging yet rewarding hunting experience. Some climbing is required, and a keen eye, as they rarely come out into the open. 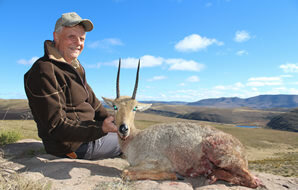 The Eastern Cape is prime mountain reedbuck territory. 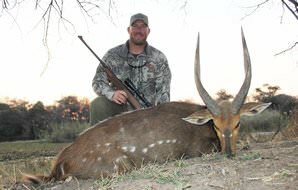 The nyala is more elusive than its spiral-horned cousin the kudu, which will require some patience and grit from its pursuer. Once you have him, however, he'll likely be the most beautiful trophy in your collection. The unique-looking red hartebeest is known as the 'Harley Davidson' amongst hunters, due to the strange shape of its horns and elongated face. This is a startlingly swift - but perhaps fatally inquisitive - antelope. 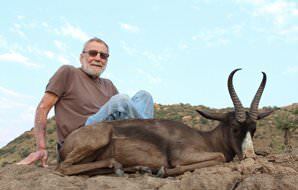 Second in size only to the eland, the roan antelope is a rare and much-desired trophy animal that is now more widespread as a result of ranching. You'll find him in open, grassy areas ideal for grazing. The little oribi is slightly larger than the steenbok, but far less common. 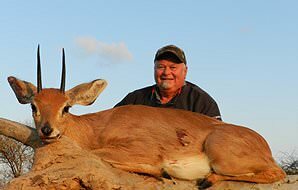 It's typically only on the lists of the most serious African trophy hunters, looking to augment their collection with something special. Ostriches make for one-of-a-kind trophies. The world's largest bird might be flightless, but he is incredibly swift on his long legs. Ostriches are usually hunted on open plains, like in the Free State or Kalahari. The sable antelope is striking because of its stark black and white coloring and stunning backward-curving horns. He makes for an aggressive quarry, but a trophy that may just become your favorite in your collection. The unique-looking black springbok is actually a 'morph' species of the common springbok, appearing darker in color due to a gene mutation. You'll find him on the same open plains and arid areas as his 'common' cousin. 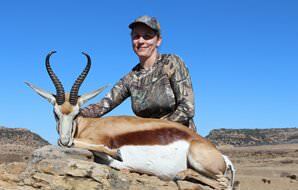 The sprightly springbok is South Africa's national animal and high on the list for many avid plains game hunters. It occurs commonly on game farms in the eastern Free State, where the land is grassy and open. 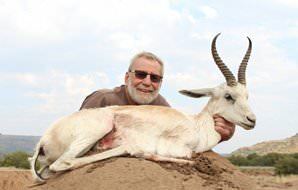 The white springbok offers an interesting color variation on the common springbok - an attractive and truly unique addition to the trophy room. He is pursued in the same manner and same areas as the common springbok. 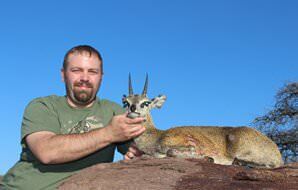 The tiny steenbok is a sought-after member of the 'Little Five' antelope species and makes a great full mount trophy. They are extremely cautious with keen senses - and you'll need to be light on your feet during the hunt. The tsessbe is one of the continent's fastest antelopes, and decidedly strange-looking. Despite his speed, he is also inquisitive - his moment of hesitation before taking flight is the perfect moment to take your shot. The waterbuck, with his luxurious shaggy coat, white-circled rump and forward-facing horns, makes for a truly beautiful trophy. 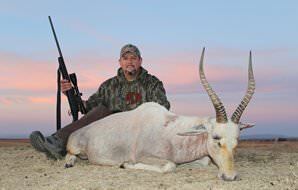 You'll never hunt this large antelope species far from a water source or floodplain. 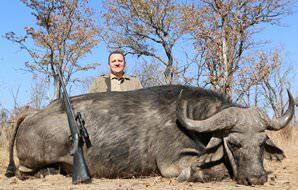 Warthogs are very popular amongst hunters and are typically pursued in the lowveld region. Its razor-sharp upper tusks are considered for trophy assessment, and its these weapons that make him formidable in the field. 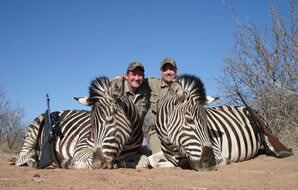 The common or Burchell's zebra is another popular plains game pursuit. You'll find him in the grasslands or wooded savanna. Males and females are often difficult to distinguish - rely on your PH to be sure. 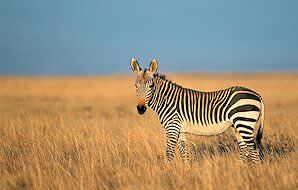 The mountain zebra is the Burchell's less common cousin. It is distinguished by its lack of shadow stripes and bare white belly. He is most commonly pursued in the Eastern Cape province of South Africa and in neighboring Namibia.